Great for indoor gardening. 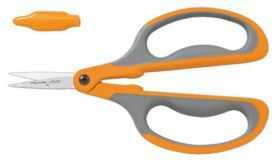 Floral Snips are great for deadheading, shaping, pruning and houseplant maintenance. The compact design allows you to easily use in dense foliage without damaging the plant. Comfort Grip® loop handles improve control, ease fatigue. Super sharp, Micro-Tip® blades give you top-of-the-line precision and control. Comfortable Softgrip® handles reduce stress and are non-slip for safety. Right or left-handed use. Fully hardened stainless steel blades holds sharp edge longer. Blade cover protects you and the blades when closed.